Books will be available for purchase. Kids welcome! 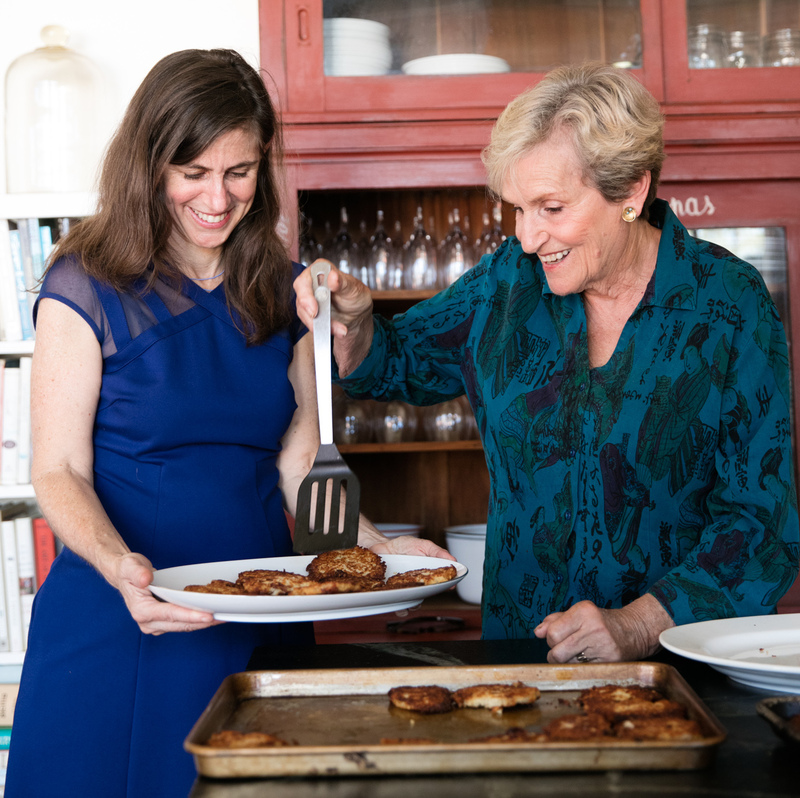 Author Leslie Jonath drew her inspiration for Feed Your People from her mother's famous latke parties and from her experience at an 18 Reasons Community Dinner. Come try the recipe that started it all! Crispy latkes are the centerpiece of this festive holiday party. Made with potatoes, onion and matzoh, these crispy latkes symbolize the miracle of Hanukkah. When topped with sour cream and/or apple sauce, latkes are a miracle in themselves. Leslie and her mom will be in the dining room eager to share their latke tips and tricks! The dinner features other favorite big-batch recipes, include Anya Fernald's Brisket, Michelle McKenzie's Grain Salad, and Claudia Roden's Orange Almond Cake. We can't wait to share this meal, and this holiday season, with you. Chef Justin Fertitta, a new addition to the 18 Reasons team, will be cooking up the menu in our kitchen, though Belcampo is generously donating their delicious brisket! Our book Feed Your People features recipes by big-hearted cooks to gather around and this latke recipe by the author’s mother is sure to help you bring your people together. In addition to latkes, this pop-up dinner will feature long-braised brisket created by Anya Fernald founder of Oakland-based Belcampo and vegetarian grain salad by Michelle McKenzie with a luscious orange cake by Claudia Roden for dessert. Feed Your People features all of these recipes and more, created by some of our favorite chefs, representing foods they love to gather around. Join us for a fun, relaxed evening, and cozy dinner. Feed Your People is a community-based cookbook created by local author Leslie Jonath, with recipes for crowd-pleasing, big batch cooking from warm-hearted cooks, chefs, and grandmas for the foods we gather around--from backyard barbecues and soup suppers, to hand-wrapped tamales, dumpling dinners, and seafood boils. Whether for a family reunion, a DIY wedding, holidays, memorials, non-profit fundraisers or a neighborhood block party, this book will inspire you and make cooking for your community a delicious, affordable, fun, memorable feast. Feed Your People was published this summer by Powerhouse Books. Click here to learn more. We will have copies available for purchase at this dinner!